Feeling generous? Supporting me on Patreon is a nice way to drop a dollar or two per month to help me make more comics! Potlucks at work are hit or miss depending on your coworkers. I’ve been lucky enough to have some great bakers and cooks found among the many people I have shared employment with over the years. The one day that everyone kind of gives up on for potluck is Black Friday. Especially in retail. Some of us are probably working from 6pm Thursday even. There’s no time to bring anything substantial for a potluck the day after Thanksgiving. People aren’t really thinking about food at that time anyway. 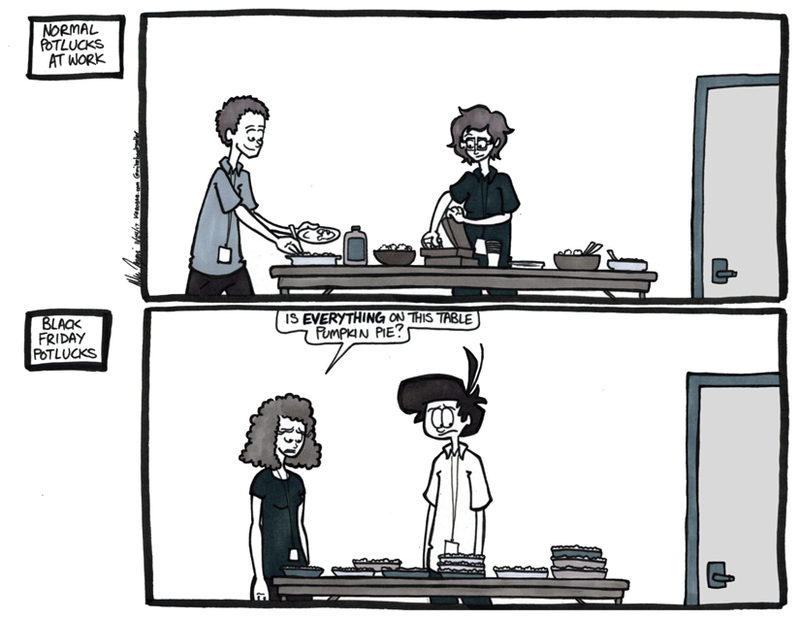 A lot of the time it isn’t even an official potluck. It’s just a bunch of leftovers you don’t want to eat and hope someone else will take home and throw it away for you. I love pumpkin pie. Well, I love my pumpkin pie. I got a fantastic recipe for it and have perfected the art form of pumpkin pie making. I tolerate other people’s pumpkin pies, and I need a whole bowl of whip cream to get through a store bought pumpkin pie. It’s a tricky beast, pumpkin pie.